Where creative spirits roam free. Whistler's vibrant arts and culture scene flourishes year round with workshops, engaging art exhibitions, lively music and dance performances to international film and culinary events. Learn more about Whistler's cultural institutions and offerings including the upcoming Whistler Wine Walk at local galleries. A journey of adventure and discovery. Home to more than mountains, arts and culture flourish in the local community. Explore Whistler’s past and present – discover the stories, milestones and unique cultural institutions awaiting you in beautiful surroundings. The Audain Art Museum is Whistler's newest cultural hot spot. Located by the Village, the iconic building houses a permanent collection of artworks from British Columbia as well as rotating exhibitions from leading museums around the world. The permanent collection features an outstanding collection of nineteenth century Northwest Coast masks, one of Canada’s strongest Emily Carr collections, a selection of Vancouver’s celebrated photo-based art plus a gallery devoted to West Coast artist Edward J. Hughes. Located in the heart of the resort, the Whistler Museum is the place to discover Whistler’s history and unique mountain culture. The Museum offers a variety of exhibits year-round, plus a busy program of seminars, interactive activities and other events. Extensive exhibits include engaging stories, historical photographs, multi-media presentations and displays including a complete original gondola cabin. Located a short walk from the village, the Lost Lake PassivHaus was built for the 2010 Winter Olympics. The building is a state-of-the-art showcase of energy efficiency combined with modern design. Situated at the entrance to Lost Lake Park, the PassivHaus includes a retail and rental shop for biking in summer and nordic sports in winter, as well as a cafe. The Maury Young Arts Centre welcomes everyone to enjoy its community art gallery, theatre, and youth centre. Visit this vibrant hub to see an exhibit and leave with a packed diary of creative classes and live entertainment. Located in the heart of the village, the Arts Centre is the pulse of arts and culture in Whistler and home of Arts Whistler. Located on Main Street in Whistler Village the Whistler Public Library is one of the busiest libraries in the province. The attractive building has been open since January 26, 2008 offering books, magazines, an audio and video library, computer access and community rooms. The Library boasts a busy event program offering training courses, workshops, seminars and movie nights plus regular singing and reading groups for children and parents. Known as ‘Whistler's Living Room’ the library is a cultural and community hub for locals, seasonals, and visitors. 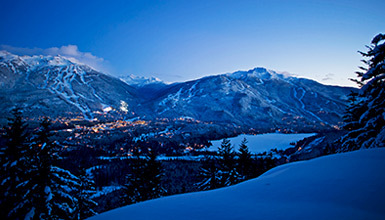 Discover Whistler’s newest attraction – Vallea Lumina. A multimedia night walk in pursuit of hidden wonders, ignite your senses with an immersive light show set in the forested surrounds of Cougar Mountain. Follow the story of two long-ago hikers and the wondrous things that happened near Whistler that confirm the legends about this place are true. Explore Whistler’s bustling gallery scene while sampling hors d’oeuvres and wines from BC wineries every Friday night in October. Each week, different public and private galleries offer a new taste of Whistler’s eclectic cultural mix featuring local, regional, and international artists. Begin anywhere you like, and try to visit all venues for the full experience. Find hidden gems or rediscover old favourites, and join us in celebrating Whistler’s art galleries this fall. Planning ahead? View the full Event Calendar for more events. Some of the following posts contain videos created by Arts Whistler, Whistler’s local arts council. Head over to the Arts Whistler website for more information the local art scene including events, workshops a full listing of local artist and information for practising artists. Take a gentle stroll around Whistler Village with a knowledgeable member of the Whistler Museum to learn more about the history of Whistler. Tours run July - August (by donation) with private tours and large group tours available on request. Many of Whistlers art galleries are locate within walking distance around the Village. The Whistler Visitor Centre have put together a guide to help you walk between them and explore some of the public art along the way. As well as a number of art galleries that house collections of world-class fine art, Whistler has a thriving public art program. Artworks are located throughout the Village, Village North, Upper Village and Whistler Creek as well as in the Village and on the Valley Trail. A self-guided walking tour of Whistler’s public artworks is a great way to experience Whistler’s art and culture scene and landscape. Each piece of art on the tour is identified with an interpretive sign, with additional information accessed through a phone or QR code. The Whistler Cultural Pass provides access to the Audain Art Museum as well as the Squamish Lil' Wat Cultural Centre at a reduced price. Save 15% when you purchase tickets as a pass. Please note that th Audain Art Gallery is closed each Tuesday. Passes are not dated and can be used at any time. Arts Whistler are a passionate bunch – passionate about Whistler, about arts, and about making arts and culture an integral part of day-to-day life. 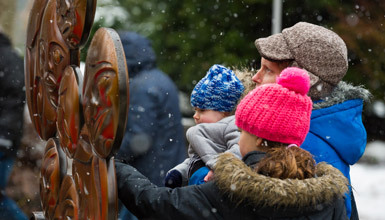 The magic happens at the Maury Young Arts Centre, right in the heart of Whistler Village, where Arts Whistler run a variety of creative classes and workshops, showcase a lineup of exciting live shows for the Performance Series, and host year-round free admission exhibits in The Gallery. Annual events include the Whistler Children’s Festival, Whistler Street Entertainment, Bizarre Bazaar, ArtWalk and Art Workshops on the Lake. As a non-profit organization established in 1982, the only thing that Arts Whistler seeks to make richer is Whistler’s love for arts and culture. The Whistler Film Festival Society (WFFS) is a charitable cultural organization dedicated to furthering the art of film by providing programs that focus on the discovery, development and promotion of new talent culminating with the must attend, 5-day Whistler Film Festival for artists, the industry and audiences in Whistler over the first weekend of December. The WFFS produces one of Canada’s leading film festivals and plays a leadership role in offering project development programs and opportunities for filmmakers. The Whistler Gallery Association was formed in 2012 by the eleven commercial art galleries with locations in the Whistler area. Most of the galleries are in Whistler Village, with two located in the Function Junction district, 8 minutes south of Whistler Village and one in Whistler Creekside, 5 minutes south of the Village. The Association represents the interests of Whistler’s commercial fine art dealers, and provides a venue for co-operative marketing campaigns such as the Whistler Gallery Walk. The Whistler Public Art Program Committee meets monthly to discuss art projects and sets the program for obtaining and implementing public art. The Committee consists of ten volunteers who are appointed by Council and includes: artists, gallery owners, Whistler Arts Council members, business community members, urban designers and developers, a member of Council; and Whistler residents who are passionate about art. Members have knowledge of contemporary art, are committed to excellence, and represent the community. They are also responsible for managing all public art projects to ensure that they are safe and durable. It's time to slow down and appreciate the little things - explore Whistler's Cultural Connector with Dee Raffo.